Earlier today I was in a coffee bar in downtown Tallin, Estonia. On the table next to me was a man with an iPad. Nothing strange in that, you might think. But this gentleman was in his 70s. Yesterday, as I sat at Heathrow Airport I was surrounded by iPad and other tablet users – but few were below the age of 50. Now, iPads are not cheap – so it is much more likely that people with he most disposable income are going to be the main purchasers. That means students can’t afford them for themselves – Mum and Dad have to buy them…! Even younger people in work – who you might think would be attracted by tablet devices – are less likely than the middle-aged and elderly to be able to afford such devices. But it isn’t about affordability. Recently, the chief executive of a chain of British High Street stores told me that after Christmas last year, the sales of their products via iPads more than doubled and now represents around 25% of their e-commerce business. And that’s a company where the average age of their shoppers is 62. What’s going on? 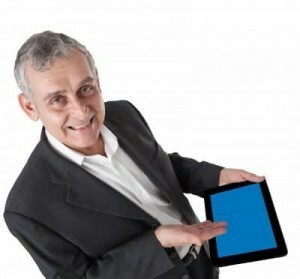 Why do older people love the iPad or its ilk? It’s because it isn’t “technology”. You don’t need fancy “input devices” like a mouse. Neither do you need to plug things in or understand phrases like “now plug in your USB dongle”. No; all you need to operate a tablet device are your fingers. Even geriatric technophobes can do that…! For anyone selling online the current trend in mobile take-up not only means increased sales through that channel, but it also means changes in demographics of your web visitors. Are you ready for that?